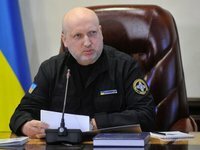 Secretary of the National Security and Defense Council of Ukraine Oleksandr Turchynov has said that the number of forces and troops involved in the Russian-Belarusian exercises Zapad 2017 is much higher than it was officially announced and that Belarusian President Alexander Lukashenko has canceled his visit to Russia because of the defiant behavior of Russian military towards Belarusian citizens. "The active phase of these exercises is conducted simultaneously at six military training grounds of the Russian Federation and five military training grounds of the Republic of Belarus, which makes it possible to cover the real scale of the involvement of troops (forces), which significantly exceeds the number officially announced. As of September 19, the actual number of participants in all events, which were conducted as part of Zapad 2017, is estimated at 120,000 people, more than 10,000 units of military equipment, about 100 aircraft and about 40 ships/submarines of various classes," the council's press service quoted Turchynov as saying on Tuesday, September 19. He also noted that in the final part of the exercises the Russian and Belarusian presidents planned to jointly visit a firing ground in Russia. "However, due to the growth of protest sentiments in Belarus related to the holding of the Zapad 2017 exercises, because of the defiant behavior of Russian servicemen towards citizens of Belarus, President Lukashenko cancelled his trip to Russia and decided to observe the exercises solely at a training ground in Belarus," Turchynov added.